Like all emergency management agencies, DEM operates within the emergency management cycle. 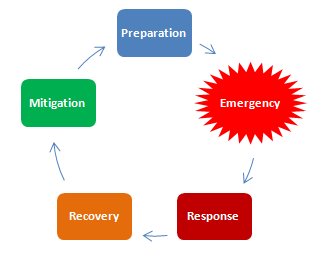 This cycle has four phases: preparation, response, recovery, and mitigation. We describe each phase in more detail below. As the diagram to the right shows, these phases occur before, during, and after emergencies. The unpredictable timing of emergencies means we perform many of our response and recovery duties on little or no notice. Mitigation and preparedness activities occur year-round, except when response and recovery take precedence. Our 2013 annual report has more on our mission and a view of what we do in a typical year. Preparation is what we do to help the community and our partner agencies get ready for an emergency. We coordinate training for volunteers and full-time staff to ensure everyone who responds to an incident knows what to do and how to do it. Through federal homeland security grants, state emergency management funds, and the urban county budget, we obtain equipment and arrange training so our professional responders have the tools to do their jobs. We work with organizations across and beyond Fayette County to plan responses to a wide range of threats, from natural disasters to failures of technology. The Lexington-Fayette County Emergency Operations Plan (EOP) is a high-level planning document that defines the threats facing our community and sets out the roles and responsibilities for responses to each one. Part of preparedness is understanding the threats to the community. With our partners in the police and fire departments, we’re Lexington’s threat analysts. We study previous events that have affected Lexington and other communities so we can understand their effects. This understanding helps us better plan our responses. The lessons we learn here also flow into our recovery and mitigation duties. Through our community outreach efforts and public information campaigns, we teach citizens how to help themselves and their neighbors during emergencies. This individual and household readiness helps improve the whole community’s preparedness. In conjunction with the fire department, we run Lexington’s Community Emergency Response Team (CERT) program. We also work with other government agencies, private-sector partners, and non-profit organizations that provide preparedness education, training, and volunteer opportunities. Through our 1620 AM radio station and our blog and social media presence, we provide the community with additional preparedness information. Response actions are what we do immediately before, during, and immediately after an event to protect life, property, and the environment. During a response to a major incident, our emergency operations center (EOC) is the focal point for coordination within and beyond the county. Some of the other county agencies represented in the EOC include fire, police, community corrections, public health, public works, geographic information systems, and social services, along with the Red Cross and private utility companies. The EOC’s communications capability and staff also make it Fayette County’s point of contact with state and federal officials and our counterparts in neighboring counties. In the emergency management profession, we consider response a proactive function. In other words, if we see an event coming, we don’t have to wait for it to happen before we begin to respond to it. Whenever we have advance warning of a potential threat, such as severe weather, we start “leaning forward,” monitoring the developing situation. Hours or days ahead of severe weather, we alert citizens and government officials so everyone has time to prepare. If we foresee the need for large-scale coordination across multiple agencies, we may open the EOC. If necessary, we also activate the county’s alert and notification systems to ensure every affected citizen receives timely warnings. Recovery is the process of returning the community to normal after a disaster. DEM’s recovery role involves coordination of many other organizations’ efforts. Recovery isn’t limited to clearing debris and replacing damaged or destroyed property. It also can involve caring for the community’s survivors and responders. Economic recovery – bringing back business and employment opportunities and developing new ones – is critical, too. To prepare for recovery efforts, DEM studies the recoveries of other communities that have experienced catastrophic events and determines how those lessons could help Lexington recover if similar disasters occur here. Mitigation activities reduce the impact a disaster can have on a community. Some mitigation actions are physical, such as the addition of storm shelters to homes in tornado-prone areas, or the improvement of storm sewers to reduce the flooding associated with heavy rain. Others can be legal, such as codes or legislation that forbid property development in areas that see frequent flooding, wildfires, or sinkholes. Many community and individual preparedness activities also can be seen as mitigation activities, as citizens become more capable of handling emergencies through their own skills and supplies. DEM advises the Urban County Government on mitigation issues and the county mitigation plan. The most recent mitigation plan, approved in 2013, identifies 14 community hazards that are most likely to affect Lexington and outlines specific programs to reduce the potential impact of these events. DEM also is the lead agency for funding and project management for some mitigation projects, such as the construction of a tornado shelter at LFUCG’s Versailles Road campus. Lexington Emergency Management is currently updating its mitigation plan. Here’s more about what that means.